When we order pasta in Carbonara sauce, we always get a dish of pasta soaked in a creamy white sauce and while it still tastes yummy and there is nothing wrong with it, this is definitely not Spaghetti alla Carbonara. Once you have tried this recipe, we hope that you could provide us with some feedback / comments either via our blog or by joining our Mummy’s Kitchen Facebook Group. You can like us on Beyond Norm’s Facebook Page or subscribe to our blog via the right side bar to get the latest updates. Bring a small pot of water to boil. Add the four salted eggs into the water. Boil for about 10 minutes. Remove eggs from hot water. Cut each egg into half. 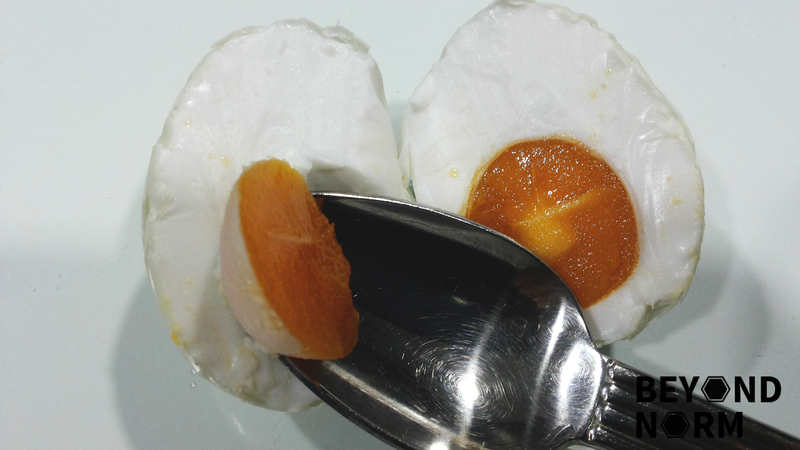 Remove the yolk from the white with the help of a butter knife or spoon. Place the yolks into a bowl. Mash them and set aside. 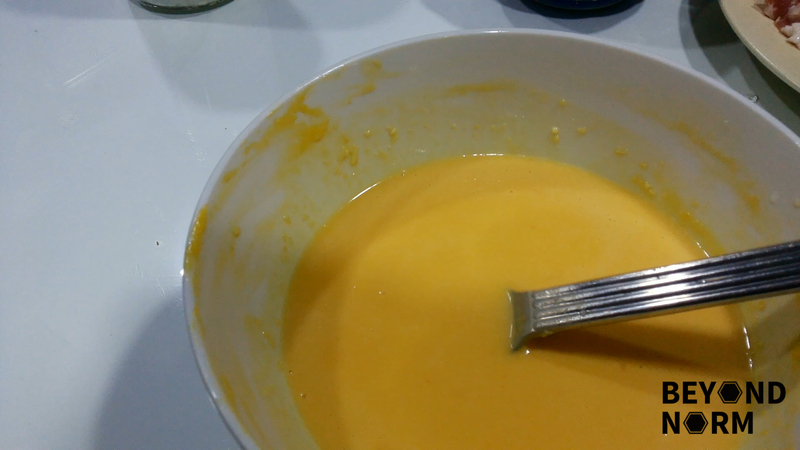 Put the eggs into a mixing bowl. 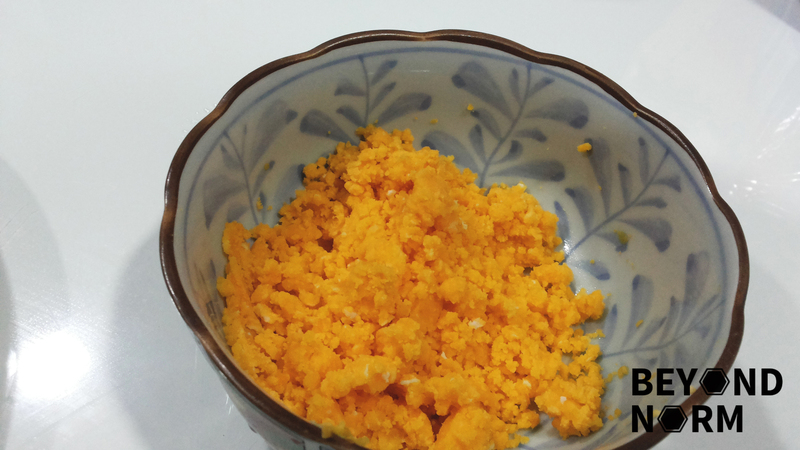 Add in the mashed salted egg yolks. Beat and stir well to ensure that it is as smooth as possible. 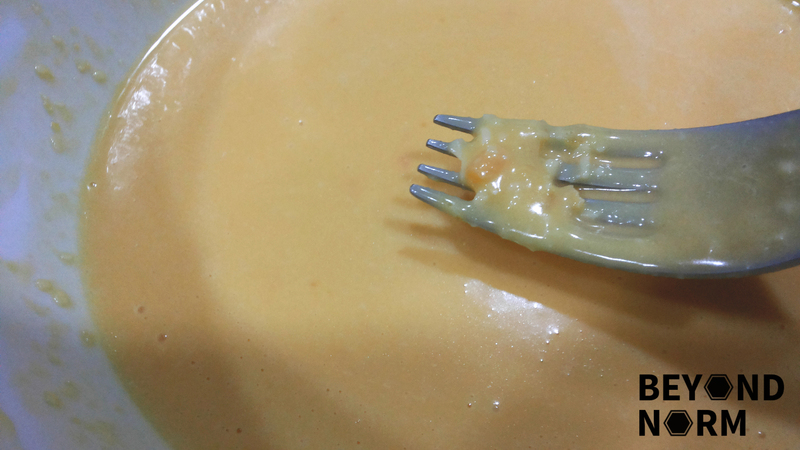 Add some tablespoons of milk or cream to thin the mixture if it is too thick. As I am using mushrooms for this dish, I prepare them first and set aside. Heat the butter in a pan over medium heat. Add the mushrooms and a pinch of salt, and stir to evenly coat the mushrooms with butter. You should hear the mushrooms sizzling. 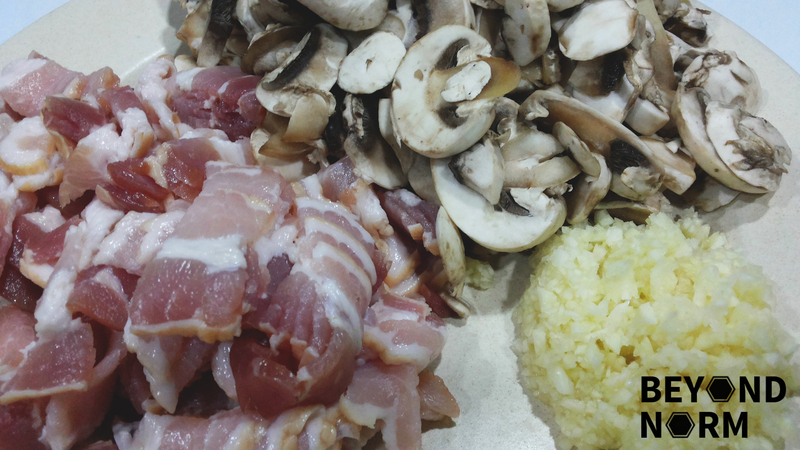 Continue cooking for 1-2 minutes, stirring frequently until the mushrooms start to release their moisture. Continue cooking the mushrooms over medium heat, stirring occasionally until all the moisture has evaporated and the mushrooms start to turn dark reddish-brown with golden spots. This should take another 5-8 minutes (total cooking time is about 10 minutes). Remove the cooked mushrooms from the pan and set aside. Bring a large pot of salted water to boil (1 tbsp salt for every 2 liters water. ), add the pasta and cook for 8 to 10 minutes or until tender yet firm (as they say in Italian “al dente”). Once the pasta is cooked al dente, drain the pasta well. Reserve half a cup of the water. 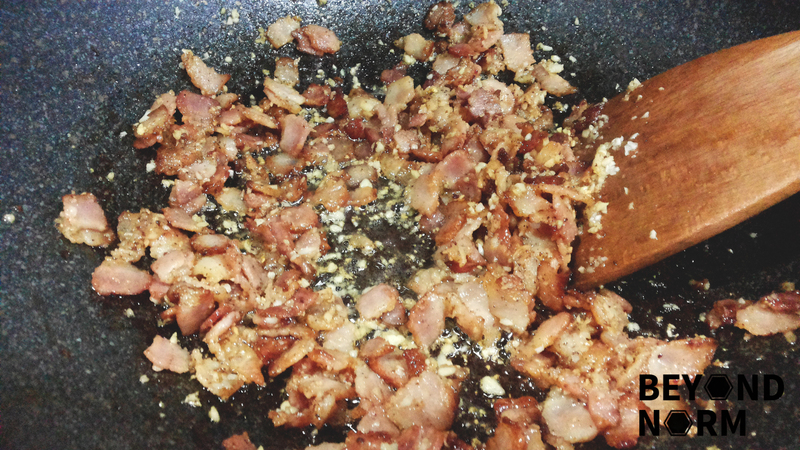 Heat a pan with the olive oil and place the pancetta/bacon. Fry them till crispy. Toss the garlic into the fat and sauté for less than 1 minute to soften. Add the hot, drained spaghetti to the pan and toss to coat the strands in the bacon fat. 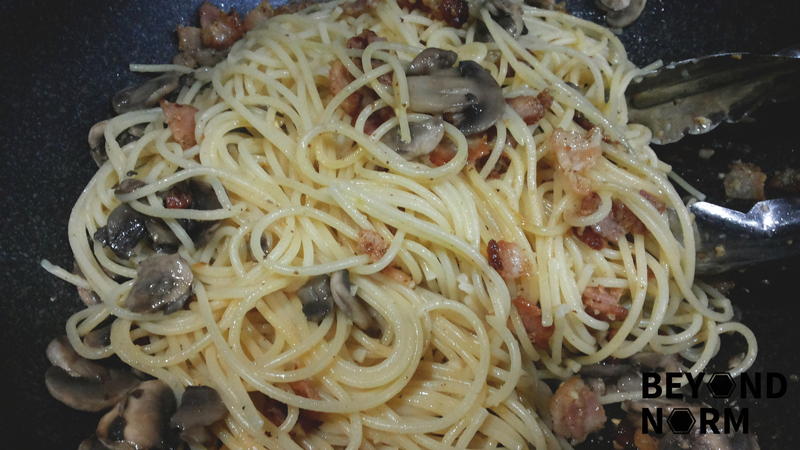 Turn off the heat and remove the pan of spaghetti and bacon from the stove. 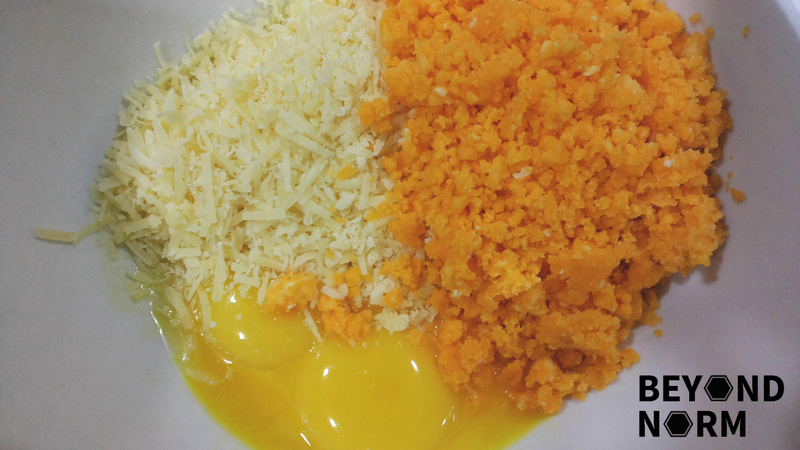 Pour in the eggs and cheese mixture as quickly as possible and using the tongs or a long fork, lift up the spaghetti so it mixes easily with the egg mixture, which thickens but doesn’t scramble, and everything is coated. Thin out the sauce with a bit of the reserved pasta water, until it reaches desired consistency. 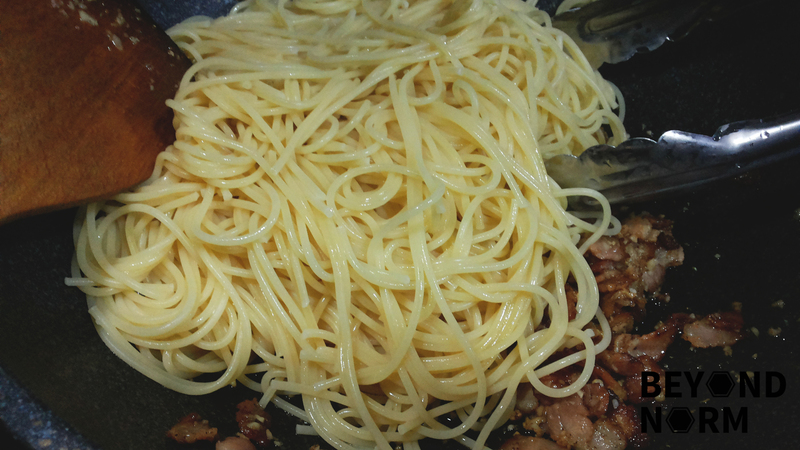 Season the carbonara with several turns of freshly ground black pepper and salt to taste. Dish the spaghetti on to the serving plate or bowl. Serve immediately with a little sprinkling of the remaining cheese, some chopped parsley and grounded black pepper.